Google Analytics Workshop Archives - More Traffic. More Leads. More Business. Here is the full outline of our Basic and Advanced Google Analytics Workshop Part 1. Why you need Google Analytics and how it can help you. The most important data in Google Analytics. Understand your visitors and how to improve engagement on your website. How to use Google Analytics to develop and improve your online marketing. How to use Google Analytics for content generation. Google Analytics lets you track and revise your marketing based on real data about your visitors. When people visit your website Google Analytics tracks what they do as they move through your website. You can get insights into your visitors and see what pages they visited, how long they stayed, what they did and when they left. This tracking data will show you what’s working (and what’s not) and where your website and marketing strategy needs improvement. Find the top content on your website. Use this to develop a content strategy that caters to what t\o your audience wants. Focus on creating complementary content that can increase user engagement and site time. Share posts, pictures, video on social media on the respective channels that are sending the most traffic. You can change the date range. This lets you see a more historic view. Compare custom date ranges to get the weeks lined up. You can view hourly, by the day, the month and the year. If you view hourly you can see if you are getting spikes during the day. You can view the different metrics in the larger view by clicking on the graph below the metric. Great comparisons are date comparisons. If you want to compare days of the week you need to select custom date ranges. If you select monthly, you’ll see all the metrics combined to compare. This will show the most accurate graph. All reports can be exported and/or saved. Add events that will impact your analytics. Speech bubble will appear. All reports in Google Analytics are made up of dimensions and metrics. Dimensions are characteristics or specific elements tracked by Google Analytics, like sessions, actions, locations; ie: what we are talking about. Metrics are the numbers and values associated with those characteristics or parts. We can drill into the dimensions and get more specific metrics. For example, if you drill into the “Location” dimension, you can change from the broader country dimension, to city, or going further down, to the local metro area. By drilling into more specific dimensions, you get very detailed information about how your visitors are using your site. Audience Overview is a quick snapshot of how your website is doing. 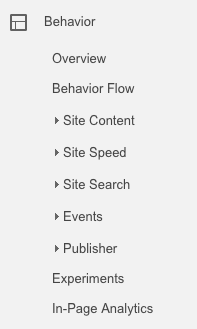 There are eleven individual reporting sections under the Audience section in your Google Analytics Dashboard. Each reporting section includes a table chart and sessions graph which shows the acquisition, behavior and conversions data for each group. Behavior: New and returning visitors compared, how much time visitors spend on your site, and how frequently visitors return. There are 8 basic metrics that tell us a lot about how we are doing. A bounce is a visit with a single engagement HIT. Good: A bounce rate between 45% and 56% is good. Concern: A bounce rate of 80% or higher lets you know people are clicking on your website but not staying. You need to find out why. A bounce rate of under 20% usually means that your analytics is not set up right. You need to check into this. This report will show you age and gender. Use a larger date range to get a better overall picture of the demographics of your visitors. You can drill into the map to see where your visitors are coming from. New visitors are getting a first impression of your site and they don’t know how to navigate your site. This shows you how your site is performing. Session Duration and Page Depth. You can hover over the bar graph to see what is the percent of the metric. Add some segments to see how you can understand the data to help you improve your website conversions. It’s important to know what browsers and operating systems your visitors are using. Your site should look good in the browsers that are bringing you the most traffic. Custom reports are user defined. You determine the variables, metrics and dimensions for your report. You can view your visitors flow through your site based on location, language, mobile device browser etc. It’s a great way to see which pages work and which pages don’t. You can email or export the data. 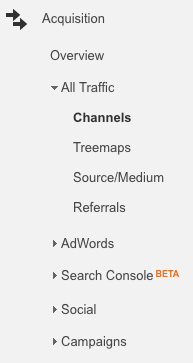 There are six individual reporting sections under the Acquisition section in your Google Analytics Dashboard. Really good way to know if our website is working well. Shows you who has talked about you. Get in touch, say thanks, ask for backlink. The behavior reports let us know how often a visitor uses your site, how long visitors stay on your site, how many days between each visit on average for repeat visitors, and how many pages they visit per session. 100% Dropoff from the home page. No visitor clicked into the website. Problem turned out to be the dropdown navigation wasn’t clickable. A quick note about Conversions. Keep in mind that you can only have 20 goals per profile and you can’t delete a goal. Get to know who your customers are so we can start to find out what are the best metrics for you. Questions about the workshop? Please contact us and we’ll get right back to you! Shoot Me a Comment or Question!